The Sistine Chapel in Rome is named for Sixtus IV della Rovere, who was Pope from 1471 to 1484. The interior walls of the chapel are covered in exquisite frescoes painted by some of the greatest Italian artists in history, including Perugino, Botticelli, Ghirlandaio, Rosselli, and of course Michelangelo, who painted the stunning frescoes which adorn the ceiling. The chapel is not only a work of art; it is in fact still used as a site of papal religious activity—the election of a new Pope takes place in the chapel, at an event called a conclave. The fresco style of painting was used throughout the chapel. 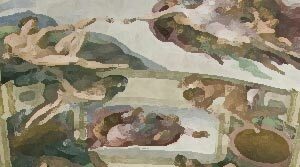 The word is derived from the Italian affresco, meaning "fresh". Fresco painting is simply painting which is done on a surface of plaster, either wet or dry depending on the method a painter chooses. For the frescos of the Sistine Chapel, layers of wet plaster were applied to walls, and then painted over, allowing the pigments to soak into the plaster. This style of fresco painting produces art which is vibrantly colored, and the frescoes in the Sistine Chapel are no exception. The walls of the chapel were painted in just eleven months, from July 1481 to May 1482, by some of the most famous Italian Renaissance painters of the era. The paintings are depictions of scenes from the Old and the New Testament, as well as a gallery of portraits of historical Popes. The north wall of the chapel contains eight panels which depict the life of Christ, from his baptism to the last supper. The south wall depicts stories of Moses. The north and south walls each contain frescoes painted by Perugino, Botticelli, Ghirlandaio, and Rosselli. The entrance wall of the chapel once contained the final episodes of the lives of Christ and Moses as depicted by Ghirlandaio and Singorelli, respectively. However, these were destroyed in 1522 due to structural collapse of that section of the chapel, and the scenes were repainted by Hendrik van den Broeck and Matteo da Lecce. Behind the altar of the chapel is The Last Judgment, painted by Michelangelo between 1536 and 1541. This is the largest single fresco to have been painted in the sixteenth century, and is simply astonishing in its detail and vivid coloring. Considered by many to be the greatest achievement of Renaissance artist Michelangelo, the ceiling of the Sistine Chapel is an awe-inspiring work of art. It is a huge work in terms of both subject matter and size, with incredible attention to detail, from facial expressions to hand gestures even on the figures surrounding the nine main panels. Just as impressive is the incredible amount of work that went into creating it—Michelangelo painted the piece over a period of four years, enduring considerable physical discomfort from standing upright close to the ceiling, with his face turned towards it, for hours at a time. The original ceiling of the Sistine Chapel was of a blue sky dotted with golden stars; it was not until 1508 that Michelangelo was commissioned by Pope Julius II to repaint the area. The ceiling of the chapel as painted by Michelangelo depicts nine scenes from the Book of Genesis, perhaps the most famous of which is The Creation of Adam. The ceiling is more than twenty meters above the floor of the Chapel; however the painted figures are so large and well-defined that a viewer on the floor can easily see the smaller details of these stunning frescoes. The Sistine Chapel is part of the Vatican Museum Collection, which is open every day of the year except Sundays and religious holidays. The ticket price of four to twelve Euros includes admission to the Sistine Chapel, as well as all museums in the Vatican Museums Collection. Note that taking photographs and touching walls in the Sistine Chapel is forbidden. These activities are forbidden to help preserve the frescoes from color fading and erosion caused by bright lights and moisture.